This Sephardic Purim treat is rarely mentioned in Purim recipe lineups, overshadowed in familiarity by its Western European counterpart Hamantaschen. It’s a shame though, because this dessert is light, and deliciously addictive. 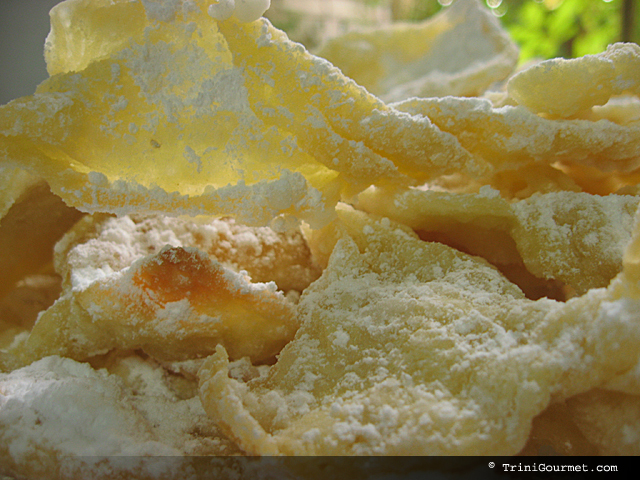 Strips of dough are fried and sprinkled with confectioners sugar. I personally like to flavour the dough with a combination of almond and vanilla essences. The result is similar to the Indo-Trinidadian treat kurma (recipe coming soon!). Yum Yum Yum! 1. Sift together the flour and baking powder and make a well in the centre. 2. Drop in the egg and add the water and orange flower water. 4. Roll out on a lightly floured board, sprinkling the pin with flour to prevent sticking. 5. When very thin, cut into 4 in. rounds. 6. Re-roll the trimmings and use to cut more rounds. 7. Cut the circles in half, squeezing the centres slightly to make ear shapes. 8. Heat some oil in a deep pan and fry the ears, a few at a time, until they are golden brown. 9. It only takes a few minutes. 10. Drain the pastries on kitchen paper and sprinkle with sifted icing sugar.